Toys and games are tons of fun for kids and adults. Whether your kids are working on a puzzle, playing with building blocks or even inventing their own games, here are a few things to think about to help them stay safer and have a blast. In 2011, an estimated 262,300 children were treated in an emergency room for a toy-related injury. That’s 718 kids every day. More than a third of those injured were children 4 and under. Check for lead in foreign-made toys. If your children have their hearts set on a new bike, skateboard, scooter or other riding equipment, be sure to include a helmet to keep them safe while they’re having fun. Get them used to wearing a helmet early. 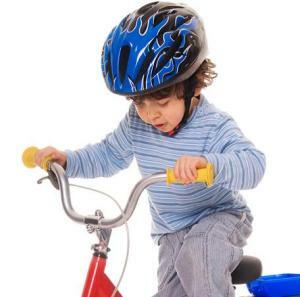 The kids are watching, so don’t forget your own helmet when you hop on your bike!